Close-up portrait of a beautiful ballet dancer training near the ballet barre in a ballet class. 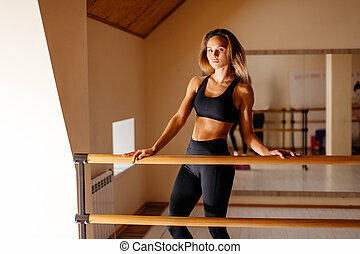 The girl is training near the ballet barre. She is in the ballet class. She wants to become a ballerina. Close-up portrait of a beautiful ballet dancer training near the ballet barre in a ballet class. View from the back. 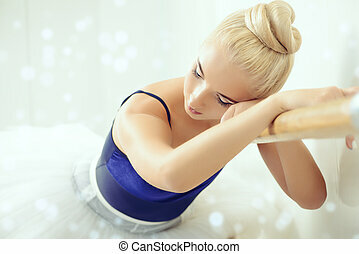 Modern ballet dancer in a ballet class. Professional ballet dancer training in a ballet class.